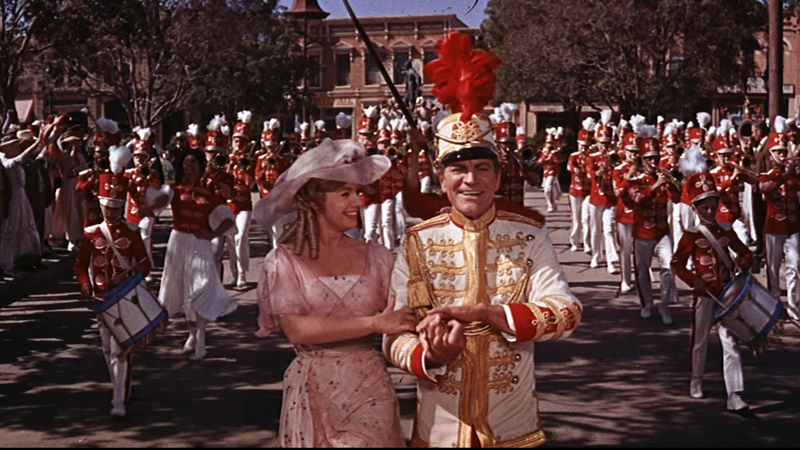 The Music Man is exuberant fun, nicely decked out as a physical production in bright color, broadly but winningly played by its cast, featuring a slew of memorable songs, some comfortably nestled on the shelf labeled Iconic. A $23,100,000 take made it the fifth biggest hit of 1962, drawing six Oscar nominations: Best Picture, Music Score, Art Direction, Costume Design, Film Editing and Sound. Prof. Preston parades: presents pool-playing perils. It was a crowded field of acting nominees that year but somehow they couldn’t (or wouldn’t, who knows?) find a spot for Robert Preston’s zippedy-do-dah gallop as River City’s swindler/savior. He certainly owns this Iowa real estate with as much confidence as Yul ruled Thailand. Preston had a long movie career but it had big gaps in it—he’d only done one film in the five years prior to this (the fine drama The Dark at the Top of The Stairs), then appeared in just three right after this before waiting another decade, showing up as Steve McQueen’s pop in Junior Bonner. This was his Big Year on the Big Screen as he also claimed a nifty role in How The West Was Won. Maybe the Academy felt he’d snubbed Hollywood for the stage and that’s why they left him off the line-up. I’d have bumped Marcello Mastroianni (Divorce Italian Style) to make room. But then, I’d take Peck’s win for To Kill a Mockingbird and give it to O’Toole’s Lawrence of Arabia and despite howls from the mob I’d bring Brando out of press-purgatory and nominate him for Mutiny On The Bounty—so what the Hill do I know? Child is vexed by ‘s’. Shirley Jones’ lovely voice gets good play, while Hermione Gingold and Paul Ford have fun laying into their epochal pronunciation riffs. 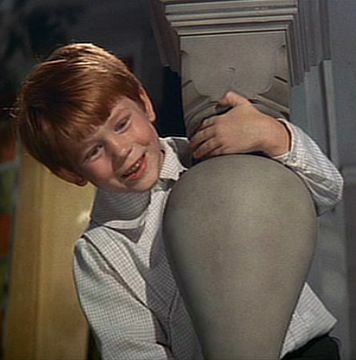 Buddy Hackett seems like an add-on, and Timmy Everett might as well scream ‘Broadway!’, but Pert Kelson brings it, and 8-year old Ronny Howard is cute. Those tongue-confrangulatious lyrics are a kick. Good work from The Buffalo Bills, Susan Luckey, Harry Hickox, Mary Wickes and Max Showalter. The only real fly in the buttermilk is one common to almost all Big Musicals—there’s just a little too much: dropping at least two numbers and twenty minutes would bump its easy three star status up to a secure four. Length worked with West Side Story and The Sound of Music, but wore out welcomes on many other songfests. Mercifully, this Meredith Wilson showcase doesn’t force-feed the audience one of those godawful dream-sequence/modern-dance numbers that hobble into the glories of Oklahoma, The King and I and Fiddler on the Roof, but 151 minutes stuffs more padding than even Harold Hills suitcase can hold. Directed by Morton DaCosta, who only made two other movies, Auntie Mame and Island of Love. This remains a lot of nostalgic fun; just take a popcorn break or load the bong during one of the lesser numbers around the 2/3 mark. this was the first time i’d seen opie in color, i was surprised to see he was a red head. the sound track was one of the few lps my folks had.